Call or email us if you would like to make a private appointment outside the above opening times. We are happy to see you during the week in the evenings. For all jewellery, school, workshop, and any other enquiries, we can be contacted by phone or email during our trading hours and outside our trading hours email any time and we will get back to you as quickly as possible. Ernst Pfenninger is a creative, high quality jeweller, goldsmith and silversmith. We had many pieces individually made over a number of years and were excited every time we saw the finished article. People often noticed and commented on my wife's jewellery as it was original and superbly crafted. I recommend Ernst to the discerning. Having been a student taught by Ernst Pfenninger at Studio 303 for over 20 years I highly recommend Ernst as a teacher for anyone wanting to learn about or improve their jewellery and silversmithing skills. I had previously learnt at other schools but none can compare with that so generously taught to me by Ernst. This school is one of our cities hidden secrets. What I like best is unsparing access to the best equipment plus unstinting advice and support from Ernst in all my projects. Others in the class do interesting projects which gives additional inspiration and the friendly atmosphere adds to it as well. I found the workshops with Ernst to be fun friendly and most of all educational and inspirational. His professionalism is outstanding and pieces I made at the workshops helped me to secure an apprenticeship. Well worth the money and time and definitely not to be missed. Ernst is a teacher of outstanding skill and workmanship. The environment in which one learns is educational & inspirational yet relaxed ~ altogether an enjoyable experience which leads one into many aspects of the jewellery trade. Ernst seems to have an inexhaustible well of expertise & experience for his students to draw from... I could attend these classes till I'm 99! On behalf of everyone at the Australian Tourist Commission in Los Angeles and the many Aussie Specialists vying for the opportunity to win one, thank you for the Opal Award. The Awards are in recognition of the significant achievements amongst travel agents in the sales and marketing of Australia - competition among the agents for the Award and the beautiful trophy is fierce. Thank you for joining us at the third Mount Pleasant Maurice O’Shea Award at the Hotel Inter-Continental. We appreciate your support and enthusiasm, which has helped to make this dinner such a success and an important event on the wine industry calendar. With your continued support next year’s event should be even more successful. Ernst was my teacher for many years, it was a wonderful experience. Ernst has designed and executed pieces of jewellery for me over many years, these pieces are unique and as fashionable today as when he designed them. Ernst's workmanship is outstanding, unique and perfect. Thanks for your excellent service over the years. It has been my pleasure to work with Swiss trained jeweller Ernst Pfenninger on special projects over a number of years, one of which was most complicated because of the mechanics & originality. Ernst has the rare talent of working in different mediums & can visualise a finished product immediately. In addition, Ernst is an outstanding hands-on highly sought after jewellery teacher here in Sydney. Ernst believes in originality & perfection. He pushes you to explore your design, expand on the theme but guides you to find the best way of achieving a professional result. I like the way the classes are kept small, assuring each one of us has ample time for questions or for help with a complex piece. I wear the jewelley I made every day because they are unique & express who I am. Ernst is very generous with design ideas & the use of all of the tools. He has an amazing breadth of knowledge about jewellery construction & the workshop is very well equipped to handle any project. Ernst & Sharon provide an enjoyable & welcoming atmosphere & I can certainly recommend Studio 303 Jewellery School to anyone interested in learning the art of jewellery making & silversmithing. 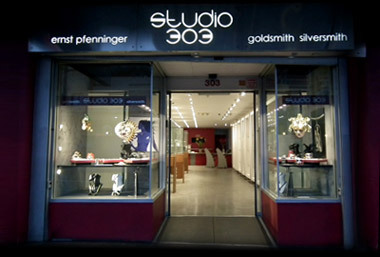 Studio 303 is a fantastic place to learn silversmithing. Ernst is technically the best lecturer I have come across in Sydney. I highly recommend the school. Ernst helps his students achieve their goals in creating their own individual jewellery and make their design concepts a reality. Challenges that arise are met with calmness & ingenuity. There is no one better to inspire a love of the creative process and leave you with the belief that in the world of jewellery anything is possible. Now that we are back from the AILA Congress in Singapore we wish to thank you both for the Gold Medal being such a splendid object. The recipient, Professor Halliday was very impressed, as were all our Executive Board, International Committee and Congress participants. Thank you for your skills, co-operations and understanding what the Medal was supposed to achieve. I have loved the creative atmosphere of Ernst's studio... I particularly enjoyed the small group situation that allowed me to progress at my own pace, developing ideas & designs into really individual pieces of work. Ernst is a patient teacher with a wicked sense of humour. He & Sharon open their workshop to students & encourage a camaraderie within the group that develops creativity & enjoyment for all participants. I am writing to say how very much the silver oar mace has been admired by the judges and the members of the legal profession. I think it is superb, only today I received a comment from a member of the House of Lords, his Lordship said it was “beautiful” and “a fitting enhancement of the Admiralty Court”. The Court is very proud of it. I have enjoyed attending Ernst Pfenninger’s closely supervised workshops for over three years, during which time my interest in silver-smithing & decorating items with semi-precious stones in the “Arts and Crafts” style has been realised many times... Ernst will provide projects to suit all abilities, particularly for those students just beginning the hobby and requiring more direction. Dr.Barrie Egerton, PhD., CPhys., MInstP. I've done 2 terms at Studio 303 (1 Days and 1 Nights) with Ernst, and I really like the freedom to create anything I want. Ernst has so much knowledge from his many years of experience that he is able to help fine tune designs so I could bring them to a finished piece. I have been a student at studio 303 for years now, I love that I can turn my ideas into reality and create one of a kind pieces. Ernst is a fun and extremely patient teacher who has helped me learn any new technique I wish to learn. I am so grateful to have the opportunity to learn from a master artisan such as Ernst. I have learned a huge amount about silver smithing from Ernst who is a master craftsman. He encourages you to show initiative and try out your own ideas but is always there to give you help when you need it. I attended Studio 303 for approx. 8 years and enjoyed the creative atmosphere, a workshop stocked with every imaginable tool and the unrivalled experience of Ernst Pfenninger. I learnt a lot from Ernst and was able to make many pieces, with his guidance, that I am very happy to wear.